To say that I love lobster would be an understatement. I am a New England girl after all ;-). I once stayed in a relationship that was very much over a couple weeks too long because my boyfriend at the time bought me a lobster dinner for my birthday. Part of me felt guilty, but part of me was like “Maybe he’s not that bad… because… you know… LOBSTER!”. Sad, but true. Are lobster goggles a thing yet? If not, I’m coining it. When the dairy allergy hit (yup I’m discussing it like a natural disaster) my options to eat lobster in a restaurant became very limited. In my opinion, the best way to enjoy it is definitely steamed with a big vat of melted butter. However my chances of finding a place that substitutes with Earth Balance are not very high haha. Also, I’m not sure if you’ve ever cooked lobster at home, but it’s a little intense and tends to stink up your whole house. 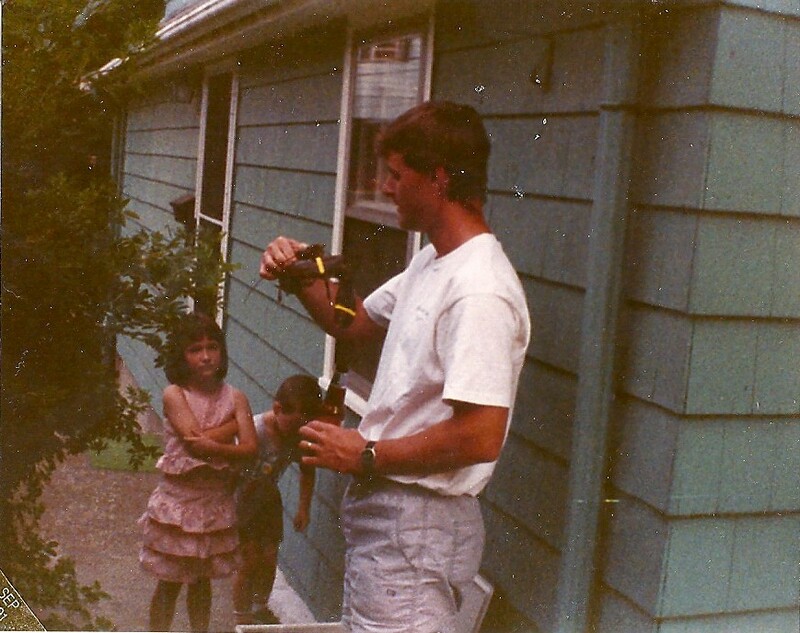 Whenever we did growing up, we’d steam them outside… big pot on the grill… at my grandparents house. I wasn’t looking for a big production, and since L’s slightly afraid of my favorite crustacean, I decided to buy some cooked meat and go the lobster roll route. No muss, no fuss, and no lobster feelers staring down L when she opens the refrigerator :-). I found this really cool mom and pop type store Alive & Kicking Lobsters down the street from me. I ended up buying by the pound, and while it was pricier than my normal meals I got a decent size tail + claws for about $7.50. Not bad at all. 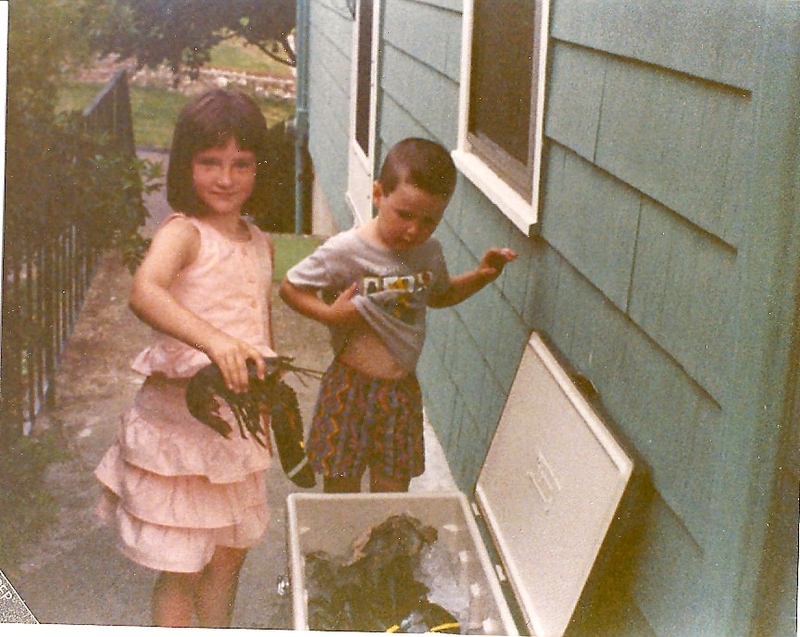 Actually it could be terrible and I have no idea since this was my first time buying lobster meat, but I already had those lobster goggles on! I knew right away I wanted to go butter style and not mayo since that’s what I am really missing! 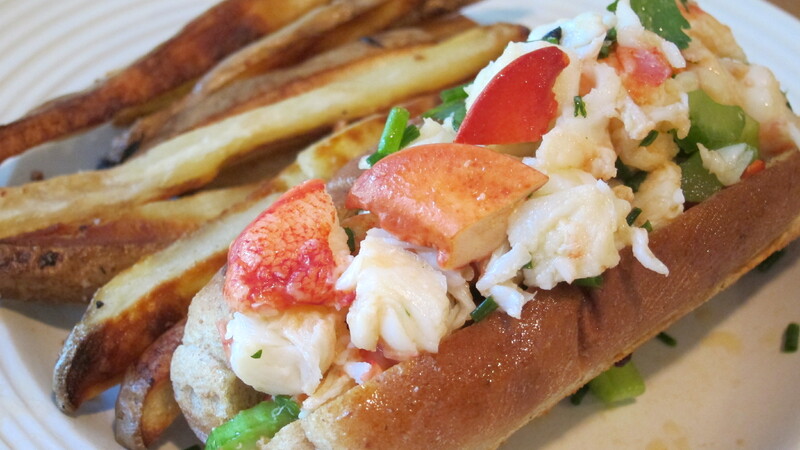 Lay out all of your lobster on a cutting board and revel in all it’s beauty. Took a LOT of will power to not just eat it right there. 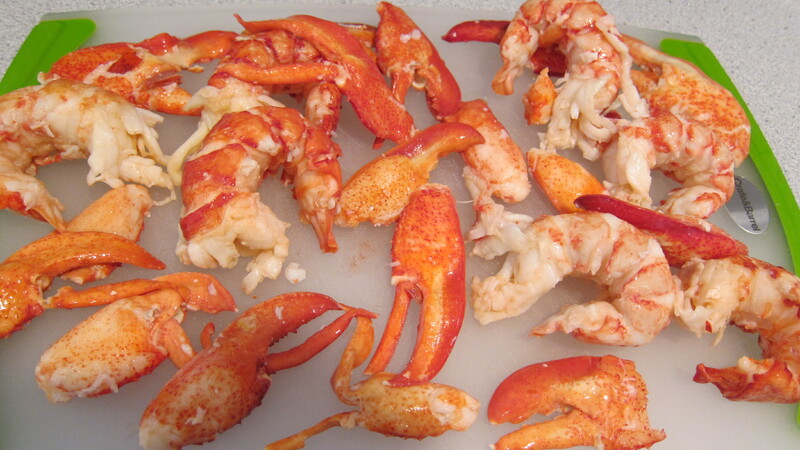 Chop lobster up into bite-size pieces, and place in a medium size bowl. Add in chives, celery, and parsley. In a small bowl whisk together olive oil and lemon juice. Add in 1 TB at a time to the lobster mixture and stir until evenly coated. I say that because I’ve been making these one day at a time and using 1 TB per serving. You could just dump it all in. Seemed like a lot of oil to me though. Toast hot dog buns in toaster oven for 1-2 minutes. I placed mine upside down using the lines of the grill to hold the inside open. In a separate small microwavable bowl, place the butter with the garlic and melt for 45 seconds. Brush the inside of the bun with the butter mixture. 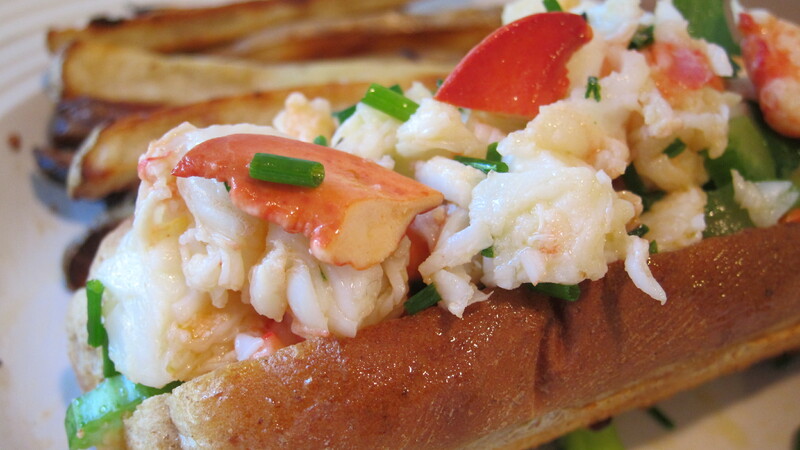 Stuff the hot dog buns with lobster mixture. They should hopefully be over-flowing. Maybe serve with some Summer Ale Fries. Try to fight off the effects from the lobster goggles, but I totally understand if you can’t :-).